Microsoft has figured out a clever way to inject some innovation into its search service, Bing, with a contest called the "King of Bing Maps." It's paying off, as Bing is getting a leg-up on its arch nemesis, Google Maps by learning some new tricks first. 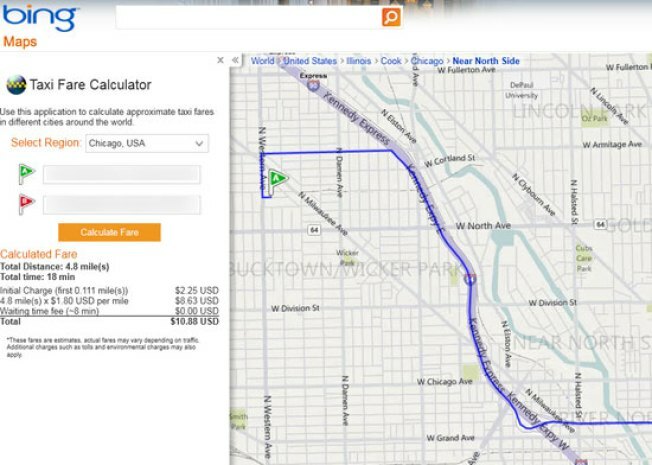 One of the most useful said tricks is Bing Maps's ability to help you calculate taxi fares. It works just the same as grabbing directions, and then at the click of a button you can get an idea of how much it'd cost you to take a cab. That's especially useful in cities or for students who, say, might have to take a cab to the airport or a job interview. It's the kind of feature that you actually could force onto Google Maps through outside services, but it itself has never popped up on Google Labs, which is a testing ground for the out-there ideas Google has in the works. There are other apps in the contest that you can check out over at Bing's blog, which will be judged and awarded prizes later this month.